Moxy, No Pin Left Standing is our exclusive product line and bowling bag. We stand behind this quality bowling bag as this comes with a 5 Year Manufacturer Warranty. For an affordable, yet durable bowling bag, choose Moxy. 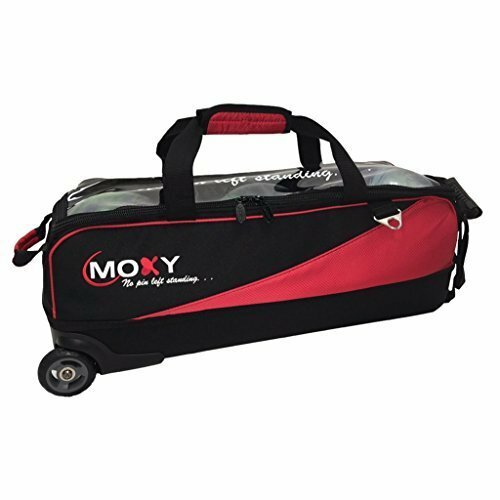 This Moxy Slim Triple Roller Bowling bag is perfect for toting the balls to the lanes for your league or tournament. This is also perfect for airline travel. Please keep in mind this bag is not intended for use as your main 3 ball roller bag as this does not hold shoes or accessories.We recommend the Moxy Backpack to hold your shoes and accessories. If you have any questions about this product by Moxy Bowling Products, contact us by completing and submitting the form below. If you are looking for a specif part number, please include it with your message.